IT Counts aims to drive positive change in how Computing is taught at secondary schools in the UK, while at the same time to inspire students, especially girls, to consider careers in technology. We organize day-long events where activities include mini lectures, interactive workshops, group activities, student competitions and presentations, interaction with current Queen Mary, University of London students and when possible, the opportunity to meet IT professionals from various London-based companies. Participating students have an opportunity to experience first hand what it is like studying technology-related subjects at University and also to gain useful insights about careers in the IT industry, now and in the future. Location: Either at QMUL Mile End campus or at School’s own premises. 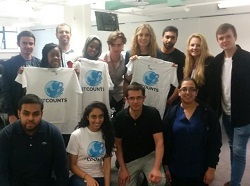 IT Counts started in 2014 in Manchester University by the ITMB students there and it expanded to include Queen Mary, University of London in 2016. It is run by Dr. Antonios Kaniadakis and his Computer Science with Management (ITMB) and Software Engineering for Business students. Contact us to arrange an IT Counts event for your school. Antonios is Programme Coordinator of the BSc Computer Science with Management (ITMB) and BSc in Software Engineering for Business. These are supported by a large network of employers and accredited by the Tech Partnership. He is also the Head of the IT & Business Management Teaching Group within the School of Electronic Engineering and Computer Science. He holds a PhD in Technology and Innovation from The University of Edinburgh and he is a Fellow of the Higher Education Academy. He has published in top information systems journals.